Rectory Meadow (0.9 Ha, 2.25 acres) is located to the west of the Crinkle-Crankle garden and is easily accessed from the churchyard, garden or Ash Grove. The parish council has the site on a lease from the church and it is maintained as an open space for residents. It contains a play area for young children and a copse to the east of the site close to the west crinkle-crankle wall. The main grassed area is regularly mown but the copse is maintained as a natural wooded area with minimal maintenance to encourage wildlife. The copse contains mainly bluebells, snowdrops and ferns, and a rare Wild Service Tree was planted here in 2014. 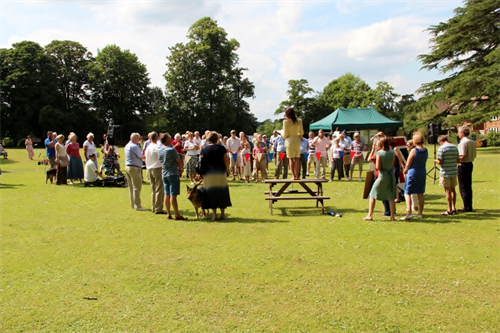 The meadow is often the site chosen for village events such as the opening of the Heritage Trail. Rectory Meadow play area is more easliy accessed from Ash Grove (restricted parking). Equipment includes monkey bars, climbing and agility frames, pod and toddler swings and a slide. Please remember to supervise your children regardless of the age group for this equipment.